Home/People and Sound/Investigate Marine Animals/How is sound used to measure plankton? Plankton are relatively small organisms that drift or float passively in the water. Planktonic animals, called zooplankton, are an important food source for many other marine animals, including fish, seals, and whales. Zooplankton swarm in dense patches within the water column or at the sea surface. Many planktonic animals have body parts that reflect sound, such as the hard mouth and tail parts of krill or the gas-bubble inside some jellyfish. Acoustical systems, similar to fish finding sonars, can be used to study zooplankton. They measure the echoes produced when sound bounces off the zooplankton. Acoustics have become an important part of plankton research. Sonar systems can quickly survey large areas to locate patches of plankton. Researchers use high frequency sonar systems that produce strong echoes after bouncing off objects in the water. They are sensitive and can be used when looking at small organisms such as plankton. However, high frequency signals fade quickly and have a short range. Low frequency signals have a much greater range than higher frequencies, but will not pick up small particles in the water column. Using sonar systems this way is sometimes called echosounding. 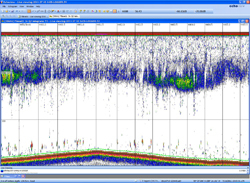 This echosounding output shows a dense plankton layer (in blue/green) near the water surface at the top of the screen, fish near the bottom (red/brown spots or lines), and the ocean floor (a red/brown line) running along the bottom of the screen. Image credit: NOAA Teacher at Sea. Scientists use echosounding to follow the movement of zooplankton and other animals. Zooplankton layers move up and down the in water column in response to light, nutrients, food, or other physical and chemical characteristics. Sonar can help scientists watch this vertical movement and see how other animals respond to it. Whales are often seen gathered in areas that have a dense layer of zooplankton. As the layers thin out or move to deeper waters, the whales leave the area. Sound can also be used to estimate the biomass of plankton. Scientists use the return signals, or echoes, to calculate how much plankton is in the water. By knowing the depth of the layer, the salinity and temperature of the water, the frequency of the sound wave, and the return time, scientists can quantify how much plankton is gathered in the water. 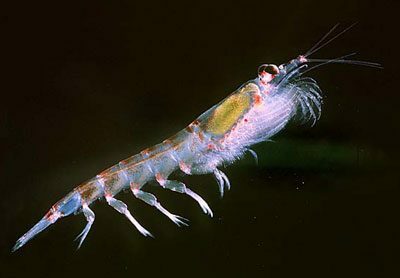 Zooplankton are too small and too close together for individual animals to be identified; however, acoustic mapping can be used to calculate their overall abundance and distribution. 1999, Alaska Sea Grant- Tools of Ecosystem Management.